Worn with an elegant skirt, a corset is transformed into a beautiful one-of-a-kind evening gown. With the enormous variety of fabrics and leathers available, you can be sure that your custom-made ensemble will be uniquely yours. Elizabeth corset of screen printed hair on cowhide and black patent leather, organdy ribbon ties. Valentine Victorian corset of scarlet bee brocade with contrasting black top and bottom trim and black and gold braid on the boning casings, worn with a full-length black moiré taffeta ballgown skirt. Valentine Victorian corset of mauve silk brocade trimmed with antique gold braid, worn with a coordinating two-layer satin and metallic silk organza ballgown skirt. Underbust Victorian corset of metallic aqua leather. 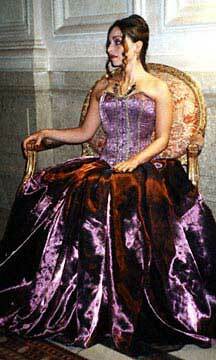 Valentine Victorian corset of multicolor metallic brocade, worn with a coordinating satin ballgown skirt. Elizabeth corset of black and brown brocade, elaborately embellished on front panel and boning casings with metallic gold trim and laces. 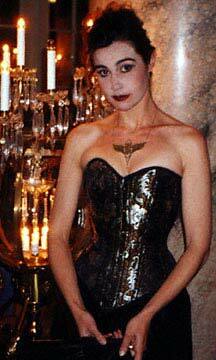 Valentine Victorian corset of Chinese silk floral brocade, worn with black charmeuse skirt. 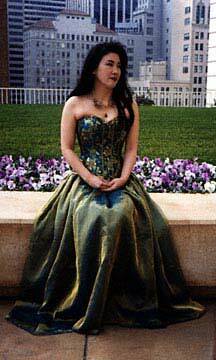 Valentine Victorian corset of teal Chinese silk brocade trimmed with gold braid on the boning casings, worn with two-layer coordinating ballgown skirt of iridescent taffeta and metallic silk organza. Red and white striped Scarlett O'Hara corset worn over black silk poet's shirt and flowing skirt. Red brocade Valentine Edwardian corset worn with slim black skirt.